Love it or hate, Gone with the Wind is a true Hollywood classic and since its release in 1939, the movie has only grown in popularity. Even though the movie was shrouded in many problems, somehow it excelled and became the template of movies to come and this my friends was truly an epic film. 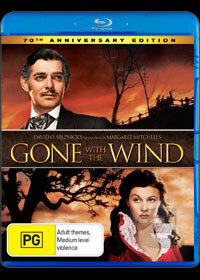 The movie even contains one of the world's most memorable Hollywood lines with "Frankly my dear, I don't give a damn" which is still heavy quoted and thanks to Clark Gable as Rhett Butler and Vivien Leigh as Scarlett O'Hara, Gone with Wind also boasted an ageless story that is still quite watchable and relatable even today, after 70 years. The story revolves around Southern beauty Scarlett O'Hara during the Civil War who is involved in a love triangle between gentlemen Ashley Wilkes (Leslie Howard) and his opposite, Rhett Butler. As both men attempt to woo Scarlet, eventually Ashley marries Melanie, believing that she is more grounded than the hot-tempered Scarlett O'Hara. Of course Scarlett moves on and eventually marries Rhett after another marriage, however she is still thoroughly in love with Ashley. Of course, this is where the heat begins and that famous Hollywood phrase comes into play that will send shivers up your spine. With beautiful cinematography and a majestic musical score, it's easy not to get lost in this timeless classic, especially with the gorgeous sounding Southern accents and amazing dialogue that all cast members get quite involved in. However without Gable and Leigh, this movie would no way be as near as the masterpiece it became. I commend Warner Bros for restoring these Golden Age of Hollywood greats and Gone with the Wind is no exception to the rule which looks simply stunning on Blu-ray. The restoration of Gone with the Wind has truly revolutionised the picture quality and although it still contains that classic Hollywood charm, the image quality, colours are truly outstanding, even the backgrounds. However the standout moment of the film is definitely the amazing red dress that Scarlett O'Hara wore which made her a temptress not to be crossed and one who usually gets want she wants. With strong levels of black, one could almost be mistaken in thinking that this movie was filmed more recently, rather than 70 years ago. The only drawback to the restoration is the sound quality which seems a little muted, however considering that Dolby Digital 5.1 was not even a thought in 1939, Warner have done a rather impressive job at creating the 5.1 mix. What more is there to say but a perfect Hollywood classic on Blu-ray!